I thought it was time i informed everyone who has a late 1960s house about the risks of green goo in there electrical system. I have been showing this article below to my customers for years to explain what i was talking about. The PVC cable we use in our homes to carry the electricity is were the problem begins. In the late 1960s to make the cable more pliable for installation di-isoctylphthalate was added. The green goo is a side affect of this process. 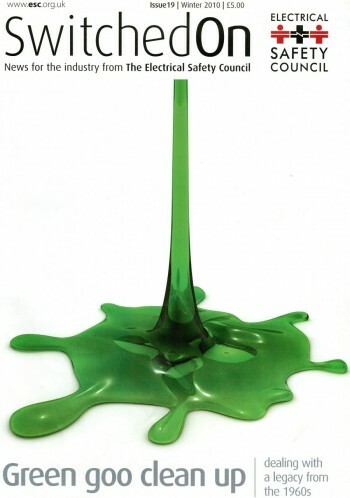 It is a literally a green goo coming out of sockets, lights and any other electrical point. The risk is if the cable leaches the green goo out it can become brittle and the cable may fail if disturbed causing other potential Danger. The best advise is get it checked if your are in any concerns about this problem. The problem was most prevalent between 1965 and 1971 when an antioxidant was introduced. This entry was posted in Domestic and tagged domestic electrician, electrical vedagre, electrician, family business, green goo, local electrician, stafford, staffordshire.